More and more start-ups and innovative projects are opting for alternative forms of financing. For the entities alternative play a role not only in being able to organise their raising of capital in a more independent way via new media, but also in being able to be closer to their future customers and business partners. It depends heavily on the type of funding whether or not the FMA has competences in this regard. It is material whether you wish to operate a donation-based (donation or reward-based) platform or a crowd investing platform. Donation or reward-based crowdfunding is generally only affected by the supervisory laws, in the case that the platform also handles the processing of payments between the crowd and the projects. In this case a licence in accordance with the Payment Services Act 2018 (ZaDiG 2018; Zahlungsdienstegesetz 2018) may be necessary, such as for money remittance business (Article 1 para. 2 no. 6 ZaDiG 2018). Many platforms therefore incorporate a licenced partner, so that an account belonging to the platform itself is therefore not involved in the transfer procedure. If the platform only initiated the payments without transferring them through their own accounts, then the new activity requiring a licence of a payment initiation service is to be observed, which was implemented in the Payment Services Directive II (PSD II) (Article 1 para. 2 no. 7 ZaDiG 2018). In the case of crowd investing the requirement of a licence is on the one hand dependent on the type of the investment and on the other hand dependent on the type of platform activity. Furthermore, it should always be remembered that the public offering of certain types of investments (securities and investments pursuant to the Capital Market Act (KMG; Kapitalmarktgesetz)) require a prospectus to be issued. Credit intermediation platforms may only operate if they have a licence pursuant to Article 1 para. 1 no. 18 point b of the Austrian Bank Act (BWG; Bankwesengesetz) or if they operate with one of the business licences listed therein. You are, however, always running the risk of providing an unauthorised lending business (Article 1 para.1 no. 3 BWG) for users. Classic P2P credit intermediation activities are therefore only implementable in Austria with considerable difficulty. Platforms that broker transferable securities (e.g. Shares, bonds, participation certificates) or other financial instruments pursuant to Article 1 no. 7 of the Securities Supervision Act of 2018 (WAG 2018 – Wertpapieraufsichtsgesetz 2018), generally fall within the scope of application of Article 3 para. 2 no. 3 WAG 2018 (receiving and transmitting of orders in relation to financial instruments) are therefore provide an investment service that requires a licence. If the platform provides customers with investment recommendations, then investment advice pursuant to Article 3 para. 2 no. 1 WAG 2018 would be provided. In some cases, on the basis of the design of the investment in the form of deposit-taking business (Article 1 para. 1 no. 1 BWG) the brokerage activity listed in Article 1 para. 1 no. 18 point a BWG may apply. Both the platform as well as the project then are providing an activity that requires a licence. If it is not planned to operate a platform, but you wish instead to start a crowdfunding project, you will have to take in account that there is a licencing requirement, with investments for which there is an unconditional repayment claim usually covered under the activity of deposit-taking business pursuant to Article 1 para. 1 no. 1 BWG. In the case of projects, in which the company receives the funds and reinvests them in other companies, rather than being operational themselves, the Alternative Investment Fund Managers Act (AIFMG) frequently applies. The issue of the obligation to publish a prospectus is in any case a central one for crowd investing projects. In the event that one of the exemptions stipulated in Article 3 of the Capital Markets Act does not apply (for example the offering being restricted to fewer than 150 investors, or it having a volume of less than EUR 2 million within the scope of application of the AltFG), the public offering, such as through a page on the Internet, triggers the requirement to issue a capital market prospectus. Depending on whether the offering is in the form of a security or an investment, the prospectus must either be formally approved by the FMA, or a copy of the prospectus submitted to the FMA. Even in the event that an exemption does exist from the requirement to publish a prospectus, it is also necessary to check whether there is a notification requirement in relation to the issuing calendar pursuant to Article 13 KMG. Crowd investors are usually not required to hold a licence, with one significant exception: In the case of a credit intermediation platform, the users, provided that they are active on a commercial basis, may also be conducting the activity of lending business pursuant to Article 1 para. 1 no. 3 BWG. Caution: Operating on a commercial basis is already deemed to exist, if there is the intention to create income on a recurring basis. The intention of realisation of profits is not a requirement with regard to the issues of commercial operation. 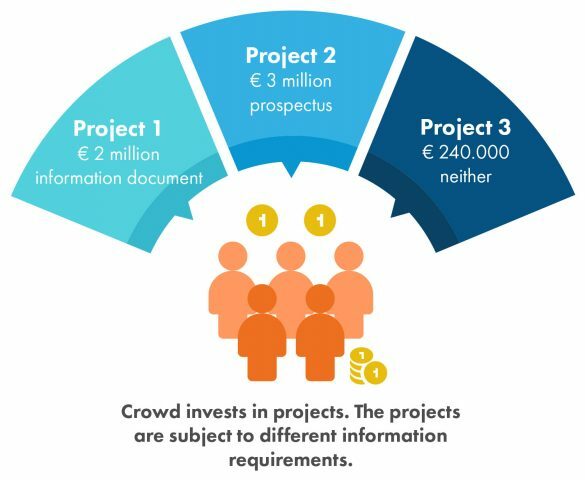 Since crowd investing covers a broad range of business models and involved parties, detailed information on crowd funding models and alternative financing addresses the issues of licencing requirements and the requirements of a prospectus are addressed in greater detail. The Alternative Financing Act (AltFG; Alternativfinanzierungsgesetz) in particular created a new exemption to the requirement to publish a prospectus in Article 3 para. 1 no. 10 KMG: instead of a prospectus there are separate information requirements under the AltFG. Crowd investments may be issued under the AltFG, if they are transferable securities or investments (e.g. shares, bonds, profit participation certificates, qualified subordinated loans). 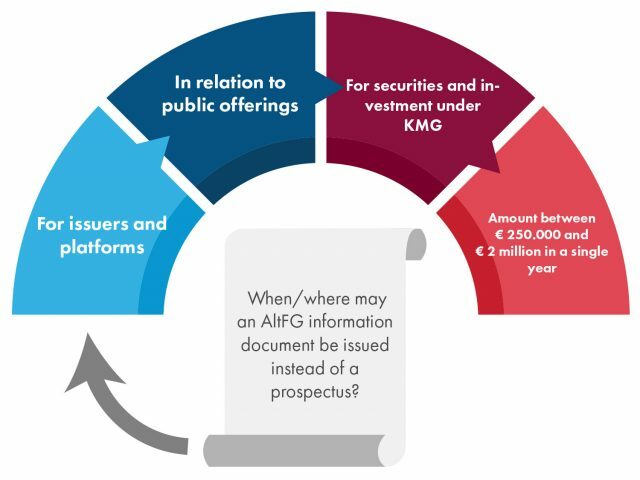 A tiered system of thresholds determines whether a full prospectus, a simplified prospectus in accordance with Scheme F in the Annex to the Capital Markets Act (KMG; Kapitalmarktgesetz), or an information document in accordance with the Alternative Financing Act (AltFG; Alternativfinanzierungsgesetz) and the Information Regulation in accordance with the AltFG (AlfF-InfoV) is necessary. Issuances of transferable securities and investments of a value of between € 250,000 and € 2 million require an information document in accordance with the AltFG. The thresholds for repeat issuances pursuant to Article 3 para 1 AltFG and the investment thresholds for investors pursuant to Article 3a AltFG must be observed. Larger issuances require a Capital Markets Act (KMG) prospectus. Smaller issuances require neither of these. Furthermore the AltFG also contains obligations for platforms through with transferable securities or investments in accordance with the AltFG are traded (in particular crowd investing platforms). Such platforms require a business licence for providing commercial financial advice or a licence to provide investment services pursuant to Article 3 WAG 2018. Separate information and due diligence obligations, rules for the prevention of money laundering and conflicts of interest apply for them. Furthermore the issuer has to observe information requirements and rules regarding its advertising; in the case that the investor is a consumer, then he/she has a special termination right. Either the Internet platform or specialists including i.a. lawyers, external auditors, notaries or financial advisers must check the submitted information documents in accordance with the AltFG for their completeness, comprehensibility and consistency. The AltFG does not fall within the FMA’s scope of enforcement, but in that of the local administrative authorities. Since an AltFG platform is also allowed to be operated by investment service providers under WAG 2018, in such cases, the FMA is responsible for supervision in accordance with the rules existing under securities supervision law. The issue of the obligation to produce a prospectus is exceptionally relevant in relation to crowd investing. Put simply, the obligation to produce a prospectus should always be checked, if you collect funds from a broad circle of investors. A public offering of an investment requiring the publication of a prospectus (a security or an investment) triggers the requirement to issue a prospectus, unless one of the exemptions stipulated in Article 3 KMG applies (for example offers to fewer than 150 investors or below a volume of EUR 2 million within the scope of application of the AltFG). This also applies to offerings on webpages. Examples of types of securities are shares, bonds or certificates; examples of investments may include limited partner participations, silent participations or qualified subordinated loans – however this always depends on the design on a case-by-case basis. Depending on whether the offering is in the form of a security or an investment, the prospectus must either be formally approved by the FMA, or a suitable prospectus auditor. Even in the event that an exemption does exist from the requirement to publish a prospectus, it is also necessary to approve the notification requirement in relation to the issuing calendar pursuant to Article 13 KMG. Since crowd investments frequently cover small or medium volumes, the exception provision contained in Article 3 para. 1 no. 10 KMG frequently applies: Issuances of transferable securities and investments of between € 250,000 and € 2 million do not require a capital market prospectus, the Alternative Financing Act (AltFG; Alternativfinanzierungsgesetz) is applicable, for further information in this regard please consult the page on the Alternative Financing Act.